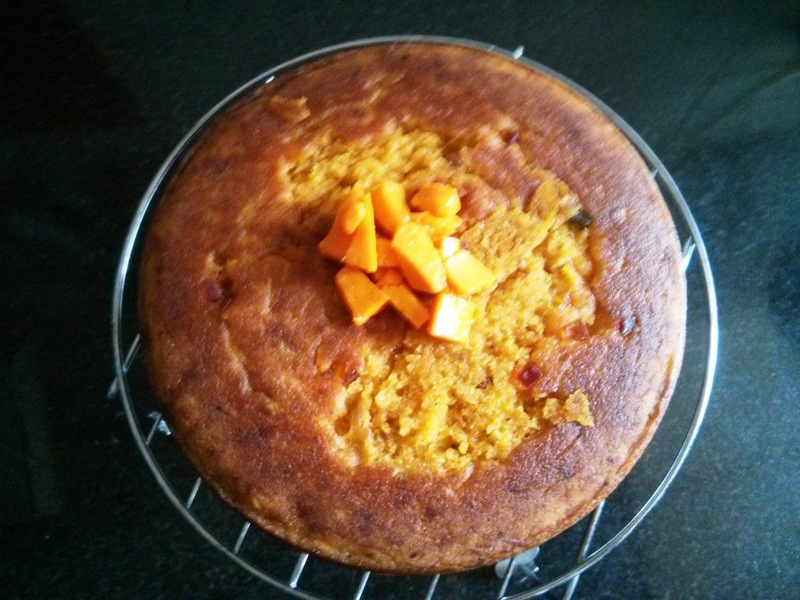 This is very simple cake baked on gas stove & tastes awesome!!! 1. Grind sugar & then add fresh mango pulp ( can use frozen ), yoghurt, baking powder & baking soda in the mixer jar to a smooth paste. 2. Take the mixture in a big bowl . Add suji & fold properly. Add melted desi ghee. 4. Add tuti fruity or seedless raisins. 5. Add Cardamom powder. Mix well. 6. Grease the non stick pan with ghee. Pour the mixture into the pan and spread it evenly. Add few drops of Ghee on top so the cake won't stick to the Tava when you flip it. 6. Keep the vessel on Tava (Griddle) & cover it with lid . Keep on low flame. 7. Check on the cake with a knife or tooth pick after 10-15 min. You should smell sweet goodness by this time! The cake should be golden brown by now. At that time flip it on the Tava (Griddle) which is kept below. 8. Turn off the flame after 2 mins as the Tava (Griddle) is already hot. 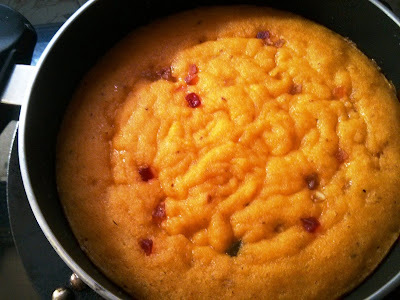 Keep it for a few minutes until the lower side of the cake becomes golden brown . Decorate with some pieces of mango. Cut into pieces & enjoy !! * If you want to bake the cake in oven : at 180 C 35 minutes. * It can be baked in the cooker also.